The Alan Kelly Gang, one of Ireland’s leading contemporary trad acts, team up with Scotland’s internationally acclaimed and mesmerizing songstress, Eddi Reader, of Fairground Attraction fame and Trashcan Sinatra’s guitarist and songwriter, John Douglas. The result is sheer musical synergy in its most natural form. Brimming with powerful instrumentals, alluring songs and buoyant harmonies this is a wonderful union of Scottish and Irish traditional and folk music from true masters. Originally put together as a once off collaboration, the idea has since developed into a global headlining act; their performances have been praised for leaving audiences spellbound. Scotland’s The Living Tradition magazine has described it as ‘an astonishing concert’. Alan Kelly has long been declared Ireland’s innovative piano accordion maestro and not only described by New York’s Irish Voice as ‘in league with the best piano accordionists in the world’ but also credited with ‘making the piano accordion hip in Ireland again’ (fRoots). He is joined by, acclaimed New York singer and flautist, Steph Geremia, Battlefield Band’s virtuoso fiddler, Alasdair White and the masterful and innovative guitarist, Ian Carr. 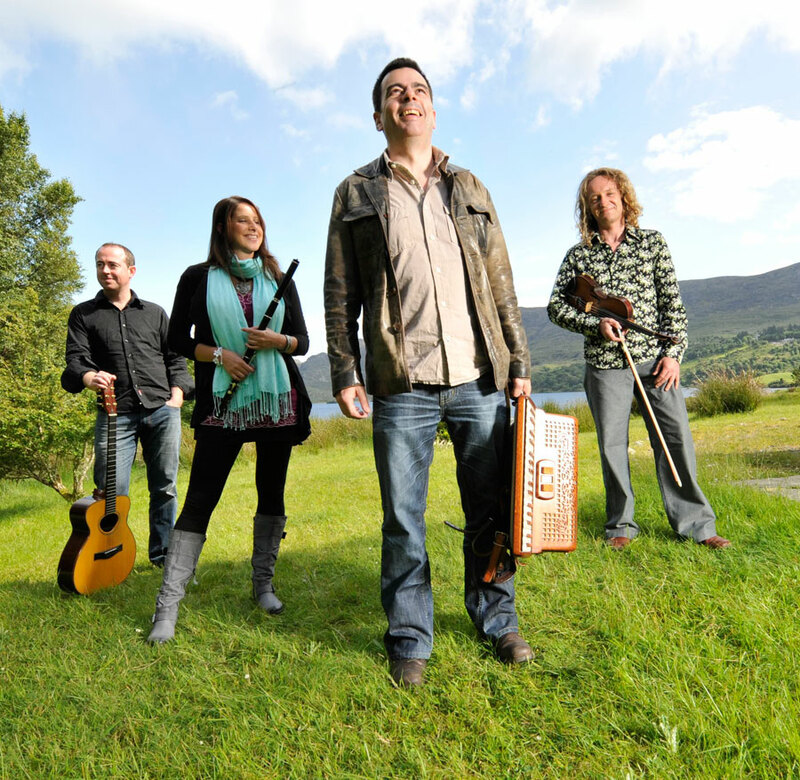 The gang delivers a unique and diverse perspective to the Celtic repertoire. The sheer energy and variation in repertoire that they infuse into their live performance has set them apart from the mold and placed them at the cutting edge of the traditional and world music scene. Eddi Reader has effortlessly developed into one of popular music’s most thrilling and affecting performers, with an MBE, a number 1 single and 7 acclaimed solo albums behind her, what sets Eddi apart is the depth and quality of the emotional performance; her ability not only to move the listener, but to connect her experience to that of her audience. From the traditional to the contemporary, Eddi extinguishes the preordained boundaries of genre, bringing joyous life to all forms of song. Her rare blend of meltingly true vocals and towering romanticism combine with an astute and pragmatic nature to make her a unique and powerful figure in contemporary British music. Eddi is joined by husband, John Douglas, a highly gifted songwriter and guitarist and member of the Scottish band, The Trashcan Sinatras. He has penned such powerful and timeless classics including, Wild Mountainside, which is included on Eddi’s classic 2003 album, The Songs of Roberts Burns. WOMADelaide (Australia), Edmonton Folk Festival (Canada), National Folk Festival (Australia), Winnipeg Folk Festival (Canada), Port Fairy Folk Festival (Australia), Celtic Connections (Scotland), Blue Mountains Music Festival (Australia), Celtic Colours (Canada), Festival de Cornouaille (France), Festival des Traversées (France), Guinness Irish Festival (Switzerland), Festival of World Cultures (Ireland), Galway Arts Festival (Ireland), Ballyshannon Folk Festival (Ireland) and Cork Folk Festival (Ireland).